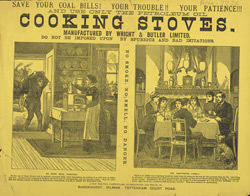 Oil and gas cooking stoves became available in Britain in the 1860s. They were not immediately popular with consumers because, unlike the coal-fuelled cast-iron ranges found in many homes, these stoves did give off much external heat, and did not warm the rooms they were in. The newer stoves required less maintenance, however, and by the 1900s the new technology had been embraced by the middle classes, as it shortened the length of baking times and made cooking much easier.